The Case For Christ -- Lee Strobel's blockbuster bestseller comes alive in this documentary that chronicles the reporter's journey from atheism to faith, he draws upon his investigative skills to examine the historical viability and accuracy of the Gospels, along with the personal claims and resurrection of Jesus Christ. He asks recognized experts some tough questions: How reliable is the New Testament? Does evidence exist for Jesus outside the Bible? Is there any reason to believe the resurrection was an actual historical event? The Case For A Creator -- As a high school freshman, Lee Strobel became convinced that God did not exist. Only the hard, empirical evidence of science could be trusted -- and it appeared to point to a universe created by purely materialistic processes… time, chance, and Darwinian evolution. This atheistic worldview deeply influenced Strobel’s academic years and early career as an award-winning journalist for the Chicago Tribune. Then, in 1980, his wife’s conversion to Christianity led him on an intensive search for the truth about God. Not surprisingly, he began with science. What do the discoveries of modern biology, physics, cosmology, and astronomy really tell us about the origin of life and the universe? When objectively considered, does contemporary scientific evidence point toward or away from a supernatural Creator? Strobel interviewed scientists and scholars from a wide range of disciplines for the answers. 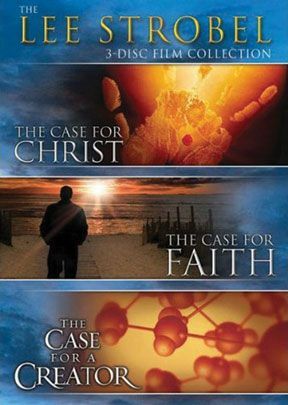 The Case For Faith -- In The Case for Faith, part of a series based on Lee Strobel's books, Strobel turns his tenacious investigative skills to the most persistent emotional objections to belief - the eight "heart" barriers to faith. The Case for Faith, based on Lee Strobel's Gold Medallion-winning book, is for those who may be feeling attracted to Jesus but who are faced with intellectual barriers standing squarely in their path. For Christians, it will deepen their convictions and give them fresh confidence in discussing Christianity with their most skeptical friends. Unmasks fraudulent cover-ups, wild speculations, and deceitful myths that have been presented as the absolute "facts" of evolution. Should evolutionism, the foundational faith of eastern mystical thought, be taught in schools as science, when Creationism, the foundational belief of Judeo-Christianity, has been expelled?